Home > Posts Tagged "RCP"
For a new Sorting Thoughts feature that give the user access to context based action items in a context menu, I learned again that Eclipse and the Command Core Expressions are sometimes not very clear. When you leave the trivial way, you can waste many many time to find the right solution. At first glance it seems to be very easy, I thought I must only register and implement a property tester and all is fine. But I was wrong. Without the help of Robert Wloch article “Property Testers with Command Core Expressions” I never thought that I have to implement a start up trigger (IStartup) and a ISelectionChangedListener too. So, if you want implement context based menu entries with property testers read the article first. 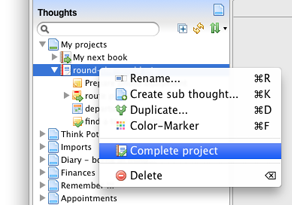 “Sorting Thoughts” is a personal information and knowledge management software. It is designed to manage your thoughts such as moments of sudden inspirations, tasks, events, projects and anything else you may think of. View more presentations from Hendrik Ebel.